When I first saw The Back in the Day Bakery Cookbook online browsing one day, I knew I had to check it out. Luckily my local library had it, and I was able to request it. 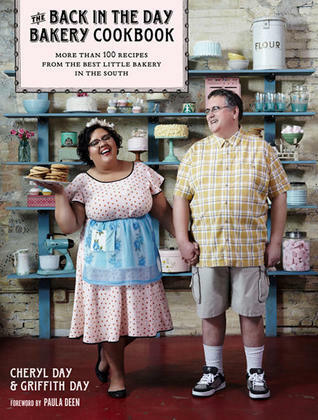 This cook book has over 100 recipes, both savory and sweet. I decided to try these amazing Buttermilk Cornmeal Pancakes since I'm not a fan of regular pancakes. They turned out so delicious!! The flavor isn't too sweet and I just love the texture that the cornmeal adds. I served them with the Mixed Berry Syrup that I posted last week. My daughter loved them so much, she ate all of the leftovers that day. Some other recipes in this cookbook that caught my eye were Mexican Hot Chocolate Shortbread Cookies and Roasted Chicken and Vegetable Cobbler. Can't wait to try them! Enjoy! In a medium mixing bowl, combine the flour, cornmeal, baking soda, salt and sugar. In a large measuring cup, whisk together the eggs, buttermilk and 6 tablespoons of the melted butter. Whisk the wet mixture into the dry, until just combined. Pour 1/4 cup of the batter onto the hot skillet for each pancake, making 4 at a time. After 2-3 minutes when bubbles start forming, lift pancake up halfway to with a spatula to check if it's golden brown. If so, flip each pancake and cook about 2 minutes more until golden brown. Serve, or keep warm on a heatproof plate in a low oven while you cook the remaining pancakes. Serve with butter and mixed berry syrup. I have this book on my Christmas wish list because my library doesn't have a copy :( Your post made me want it even more. I hope you get it soon Kelley! It's such a great cookbook! Thanks for stopping by! I am not a fan of pancakes but these look good. Thanks for sharing on Foodie Friends Friday and remember to come back and vote on Sunday. I've never had a cornmeal pancake. Sound terrific... thanks for sharing this on foodie friday. I can't wait to give these awesome pancakes a try, they look sooooo good! Hope you are having a great weekend and thank you so much for sharing with Full Plate Thursday. 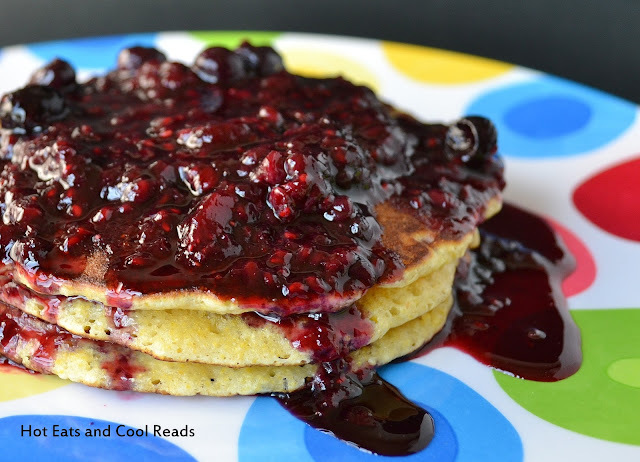 We love cornmeal pancakes :) I have to try your mixed berry syrup - every time I see it I want it! Thank you for sharing at All my Bloggy Friends this week! I think melted butter is the key to a good pancake. What a great old recipe. Thanks for sharing on Thursdays Treasures. Yay! Thanks so much for the feature Miz Helen! !